She just moved to Boston with her husband and they live in a super chic area of the city...I'm jealous. Also, if you look over her fireplace you can see a really fun and easy DIY project- she just covered up a piece of plywood with this pretty fabric- GENIUS if you ask me. HAAA! my own post. Best birthday present ever. Love what she did with their place! too cute and it's good you added her real-life example after your post today. yay! I LOVE the damask over the mantel! So chic. Great job Stephanie, the black & white theme is so chic! Happy weekend lindsi & everybody. Oh & please stop by my blog for a little giveaway. thanks much! Oh Miss Stephanie...too funny! She really cracks me up. I'm very happy you posted her example. That's a pretty big sized dining area. The place looks really good. I love the fireplace DIY. The black and white photos are also awesome. I love the idea of the plywood above the fireplace. I love the dark color scheme in the room. came across your blog today--it is rockin! i love flor rugs, i have one myself. enjoyed your posts! 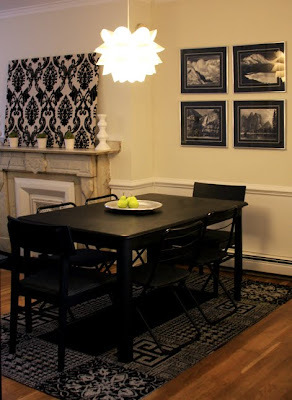 Stephanie's dining area looks great! I love Steph!!!!! She is a genius! Her dining room is beautiful! Love flor! I am using it for a client right now. Actually we used it for every room in her house! I love the pendant light above the table! Also great idea with the fabric on teh fireplace, really adds alot of texture and art to the space.